At a hearing on May 4, DDG Partners’ Peter Guthrie stated that the building’s front facade would be clad entirely in bluestone. Guthrie said the utilitarian character of bluestone would better connect to the neighborhood’s history than the previously approved limestone facade. The design included recessed windows with planted window boxes, and a planted roof canopy. 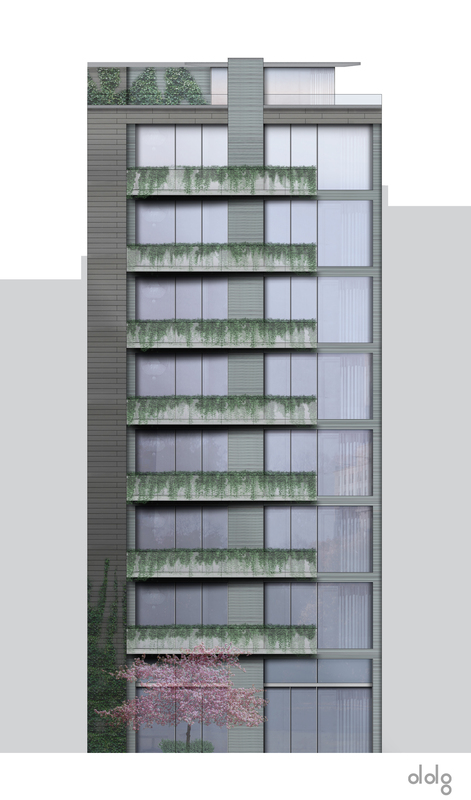 The rear facade would consist of a glass curtain wall divided by bluestone with sliding glass opening to small balconies, which would also feature plantings. Residents and preservationists expressed concerns about the use of bluestone and the impact of the balconies on adjacent neighbors. Manhattan Community Board 2’s Jane McCarthy said there was no precedent for the balconies in the district, and that they added nothing “but clutter.” McCarthy said tenants would likely use the balconies for barbecuing or storage and disturb neighbors who shared the rear courtyard. Christabel Gough, of the Society for the Architecture for the City, said the bluestone facade might be interesting in a different context, but would look “awkward” in a setting of tall and narrow commercial structures built on the old convention of masonry design. In response, Guthrie claimed that the “best precedent” for the balconies were the rear fire escapes common to buildings in the district. He also believed the balconies were unlikely to be used as entertainment spaces due to their small size. Commissioner Stephen Byrns expressed concern that the dark window frames, in conjunction with the bluestone facade, could make for a “somber” building. Byrns noted that while Landmarks did not consider issues of privacy, he did not believe the balconies would be intrusive. Commissioner Roberta Brandes Gratz found the balconies “troublesome,” but evocative of fire escapes and ultimately appropriate. Vice Chair Pablo Vengoechea said something needed to be done to counter the “overwhelming amount of bluestone,” and suggested revisions to the building’s base. Commissioner Fred Bland suggested that adding pieces of steel around the windows would give the building a more rugged look. Chair Robert B. Tierney closed the hearing without calling for a vote, and asked DDG Partners to return with revisions. Returning a week later, Guthrie described modifications to the building’s base and window surrounds. Guthrie said they considered using metal window surrounds, but ultimately found it “too aggressive.” The windows were otherwise simplified and deepened, and steel cables were removed from the window planters. At the base, the revised design featured “chunky, cleft” base stones with larger lintels to add robustness. Commissioners responded enthusiastically to the changes, with Commissioner Bland saying the changes “made a very strong building… even stronger.” After a unanimous vote to approve, Chair Tierney cited the project as an example of the “flexibility and choice” allowed in historic districts. LPC: 41 Bond Street, Manhattan (10-7604) (May 11, 2010) (Architect: DDG Partners).